Derek posted a little more information on his 24 square foot Gypsy Junker on Instructables. This micro house sleeps two and was made mostly from discarded lumber. It fits on a trailer and will probably be hauled up to his place in Vermont to serve as a micro guest house next to his bigger little cabin. Derek’s book is now in print too. It’s called Humble Homes, Simple Shacks, Cozy Cottages, Ramshackle Retreats, Funky Forts (And Whatever The Heck Else We Could Squeeze In Here!). I’ll post a complete review once my copy comes in the mail but in the mean time you can read more about this tiny house book on Derek’s blog. This entry was posted in Books and tagged book, Derek Diedricksen, Gypsy Junker, tiny house. Wow! 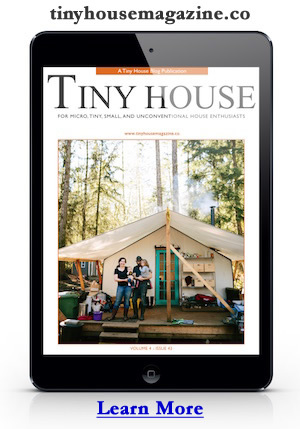 Woke up this morning, logged in, hit up tinyhousedesign.com and this was quite the surprise! Thanks Michael- appreciate the support, and when my next cabin is finished (getting close, but the New England snow always slows me down) I’ll certainly send photos your way before anyone else. ‘Been yackin’ with my likeminded younger brother about building the shantyboat featured in the book as well….and making a small documentary film on it. We’ll see…. PS- Shantyboat wise, if you haven’t read the Harlan Hubbard book of the same name, its incredible, whether you’re a small housing OR boat enthusiast!